Last week we talked about how you could use Countdownplus for work but this week it is all about how to use the app for exams. Exam season is already in full swing here in the UK and some of you may or may not still be revising in between exams. We have some tips below to help you revise for your exams. Much like with using the app for work, a lot of the time some of your friends will be revising for the same exam. So you could set up a countdown to say a particular subject like History, then you can personalise it, even if it is a countdown to an exam. Then share the code with your friends, so all of you are aware of when the exam is and how long you have left to revise for the exam. If you need an in-depth tutorial then check out the tutorial in blog form or video form. You might not want to add images to your exam countdowns and only add pictures to your exciting events. Think of it as an easy way to keep organised and make exams seem less boring. We recommend using some images from our image packs, which is an in-app purchase but adds colour to your countdowns. We think the pattern packs might suit your needs best. It will make your countdown timeline come to life. 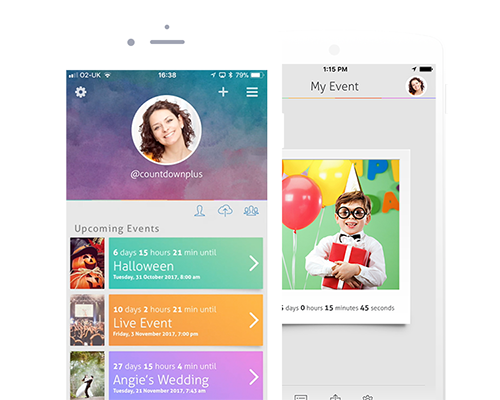 We have a feature called App Icon Countdown and it displays a number of days to your next countdown event. So this will really help out if your next event is an exam and you need to know quickly how many more days left till an event. If you want to turn it on then Open the App-More-App Icon Countdown and make sure it is turned on (green switch).